We have cats and kittens available now! 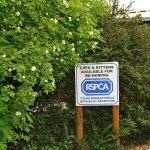 We provide a temporary home for a variety of unwanted and rescued cats and kittens through our co-operation with the Fylde Branch RSPCA. Feel free to visit and consider adopting a loving new companion. Our cats are vaccinated and spayed/neutered. For additional information, or to make a donation to help continue helping local cats in need, contact the Fylde Branch RSPCA.